As Android phones and tablets have increased in popularity, the number of apps available for the platform has rocketed. And that means more free Android games. There's a lot of junk out there but, fortunately, there are gems among the junk. We've worked our way through a whole load of Android games to reveal the one you should download to your phone today. Bubble Blaster Shooter is a one of a kind arcade, perhaps one of the best bubble shooter right now. If you’re looking for a perfect time killer, this is the perfect match for you. Thanks to its team of developers, GAAKAPPS, all phone and tablet users with Android 2.3.3 and up can now enjoy a beautifully designed game, with stunning graphics and features like you’ve never seen before. We say it’s unique because it doesn’t involve simple throwing balls or any other objects to blast. Instead, it has fun launching rockets, different types of them. 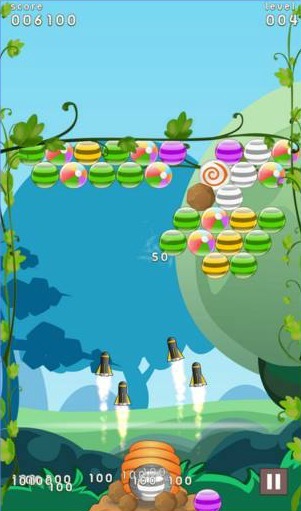 Your goal is to target and shoot at least three same colored bubbles with your rockets. The more you shoot. The higher your scores will be. Also, you can blast even more bubbles with additional boosters and power-ups (double rocket launcher targets with 4 missiles and hit bubble you point to and nearby bubbles too, bombs make the bubbles explode, electric ball explodes a whole line of the bubbles and created a huge blast, etc.). Created with 180 challenging levels and playable by all ages, Bubble Blaster Shooter can be downloaded from Google Play – free of charge!